The simplest seal used outside a bearing is the gap-type seal, which creates a small gap between the shaft and housing (fig. 1). This type of seal is adequate for grease lubricated applications that operate in dry, dust-free environments. To enhance the effectiveness of this seal, one or more concentric grooves can be machined in the housing bore at the shaft end (fig. 2). The grease emerging through the gap fills the grooves and helps to prevent the entry of contaminants. 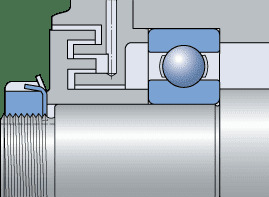 With oil lubrication and horizontal shafts, helical grooves – right-hand or left-hand depending on the direction of shaft rotation – can be machined into the shaft or housing bore (fig. 3). These grooves are designed to return emerging oil to the bearing position. 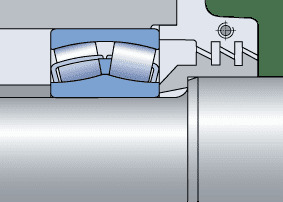 Therefore, it is essential that the shaft rotates in one direction only. 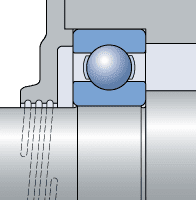 Single or multi-stage labyrinth seals, typically used with grease lubrication, are considerably more effective than simple gap-type seals, but are also more expensive. Their effectiveness can be further improved by periodically applying a water-insoluble grease, such as a grease with a lithium-calcium thickener, via a duct to the labyrinth passages. The passages of the labyrinth seal can be arranged axially (fig. 4) or radially (fig. 5), depending on the housing type (split or nonsplit), mounting procedures, available space etc. The width of the axial passages of the labyrinth (fig. 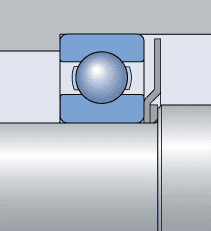 4) remain unchanged when axial displacement of the shaft occurs in operation and can therefore be very narrow. If angular misalignment of the shaft relative to the housing can occur, labyrinths with inclined passages can be used (fig. 6). 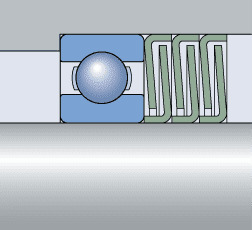 Effective and inexpensive labyrinth seals can be made using commercially available products, such as SKF sealing washers (fig. 7). Sealing effectiveness increases with the number of washer sets and can be further improved by incorporating flocked washers. For additional information on these sealing washers, refer to Power transmission seals. Rotating discs (fig. 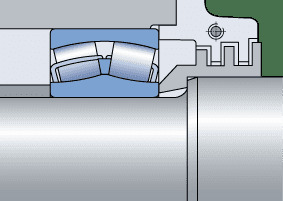 8) are often fitted to the shaft to improve the sealing action of shields. Flingers, grooves or discs are used for the same purpose with oil lubrication. 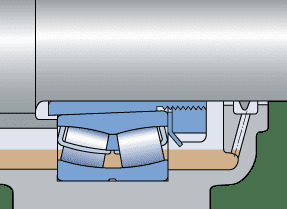 The oil from the flinger is collected in a channel in the housing and returned to the housing sump through suitable ducts (fig. 9).